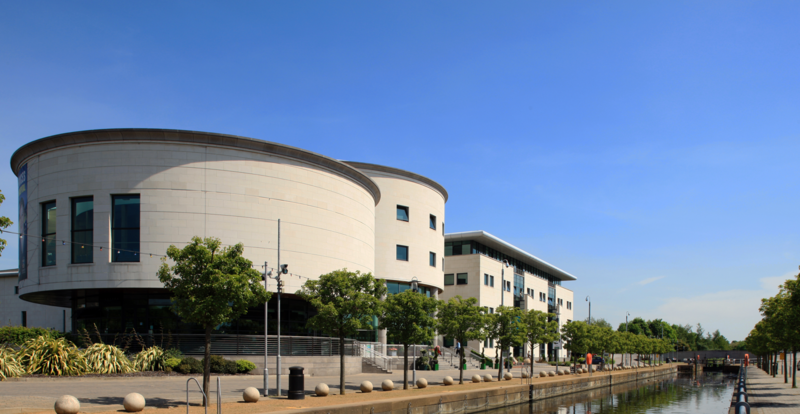 Situated on an island in the heart of Lisburn city, Lagan Valley Island is one of Northern Ireland's premier venues. The site on which Lagan Valley Island was built once played a significant role in Lisburn's industrial past. Previously the site for the Island Mill Spinning Company, famous for the production on linen through it, production at the Mill came to an end in 1983. When this happened, Lisburn City Council (then Lisburn Borough Council) purchased the site and with funding assistance from the National Lottery to the Arts Council of Northern Ireland, regeneration of this site began. The building opened for business in March 2001 and was officially opened in November 2001 by Her Majesty the Queen. Lagan Valley Island has many functions; It is headquarters of Lisburn & Castlereagh City Council and the facility is also a unique mix of civic, business and arts facilities - home to council offices, the Island Arts Centre, Council Chambers, a purpose built Conference Centre, Theatre, and stunning wedding facilities. We also manage Bradford Court located in Castlereagh which provides further office space for departments within Lisburn and Castlereagh City Council and is a base for the external organisation NILGA.